A tasty Tex-Mex-style salad dressing livens up a taco salad or homemade tacos, but it can also be used as a sauce for a Tex-Mex-style chicken or steak entree. 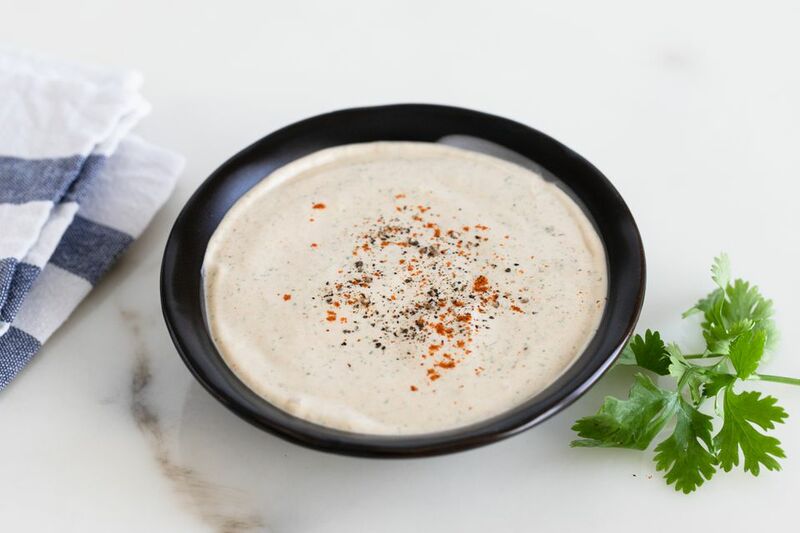 While homemade salad dressing can seem complicated or intimidating to a home cook, this sour cream-based version is easy to whip up in just a few minutes with a blender, immersion blender, or food processor. Cilantro, a common Tex-Mex ingredient that's included in this recipe, is a polarizing herb because people can perceive the taste differently. For some, it's a lovely citrusy flavor; for others, it tastes like soap. This is possibly due to a difference in the genes that recognize aldehyde chemicals, a significant component of cilantro. If you happen to be one of the people who can't stand the taste of cilantro, leave it out of the recipe. In a blender or in an immersion blender container, combine the sour cream, mayonnaise, lime juice, cumin, chili powder, salsa, and cilantro. Process until smooth and well-blended. Transfer to a serving bowl and stir in salt and pepper to taste. Cover the bowl and refrigerate until serving time. This is great as a dressing for taco salad, on tacos themselves, or as a sauce for chicken or steak entrees. It's also an excellent dressing for Southwest pasta salads made with beans, bell peppers, corn, and other traditional Tex-Mex ingredients. Light sour cream and light mayonnaise can also be used in this recipe to decrease the calorie count and grams of fat. Add some spice to the recipe by mixing in ground cayenne pepper. Start with 1/4 teaspoon and taste after adding, increasing the amount to reach the desired heat level. Because this dressing contains dairy products, it won't last as long as vinaigrette salad dressings. Keep it sealed in an airtight container in the refrigerator for up to one week. Do not freeze dairy-based salad dressings. For a higher protein and lower fat content, replace the sour cream with Greek yogurt. If you want an ultra-creamy dressing, use whole Greek yogurt. For a lower-calorie option, use fat-free yogurt, also sometimes labeled as 0% Greek yogurt. Mince the garlic before you put it the ingredients in the food processor or blender — nobody wants to bite into a large piece of raw garlic when enjoying a fresh green salad. Tex-Mex Vinaigrette: Replace the sour cream and mayonnaise with 1/4 cup salad oil, such as olive oil or canola oil, and 1 tablespoon apple cider vinegar. Increase the lime juice to 3 tablespoons to get a good amount of acid that's required for the flavor that you want to dress up salad greens. Sour Cream-Avocado Tex-Mex Dressing: Replace the mayonnaise with 1/2 cup of mashed avocado pulp.